Nebraska Corn Board Lincoln, Neb. Brian Zimmerman of Beatrice, Neb., was honored by the Nebraska Corn Board and Nebraska Pork Producers Association this past Sunday at the Nebraska State Fair. Zimmerman, owner/manager of Zimmerman Hog Farms, and his family were honored for their commitment to Nebraska agriculture. This annual award is given to a dedicated individual or family in the pork industry in Nebraska, who shows respect and devotion to improving Nebraska agriculture. Bob Dickey, farmer-director on the Nebraska Corn Board, and Alden Zuhlke, board member of the Nebraska Pork Producers Association and long time family friend, were present to honor Zimmerman and his wife, Tammy, and children, Austin and Shelby. “Brian has always worked to promote opportunities in agriculture and the pork industry for youth leaders. It’s fitting for him to receive this award at the Nebraska State Fair, where so many 4-H and FFA youth get their start,” said Zuhlke. Brian has been very involved in the state as a past president of the Nebraska Pork Producers Association and has served on the board since 1996. 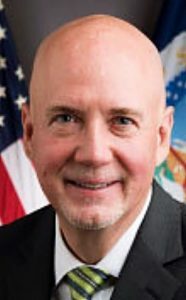 Nationally, he is just finishing his term on the National Pork Board, has served on the National Pork Board’s Administrative Committee, Animal Welfare Committee and Demand Enhancement Committee. Locally, he is member of the Blue Valley Pork Producers and has served as president and state director. The Nebraska Corn Board is a self-help program, funded and managed by Nebraska corn farmers. Producers invest in the program at a rate of 1/4 of a cent per bushel of corn sold. Nebraska corn checkoff funds are invested in programs of market development, research and education.